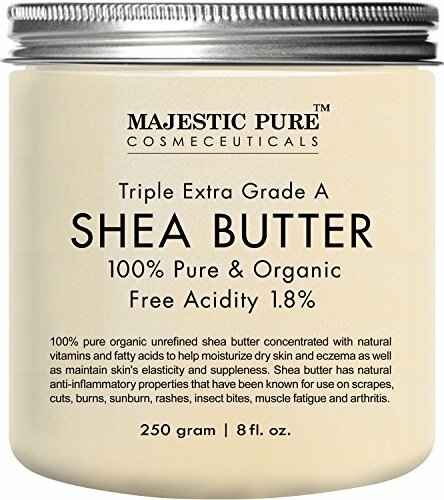 Majestic Pure Shea Butter, Organic Virgin Cold-Pressed Raw Unrefined Premium Grade from Ghana, 8 oz.. Premium grade, 100 % pure and organic virgin cold-pressed raw unrefined shea butter from Ghana, a nation on the West Africa's Gulf of Guinea; packaged in USA. Shea Butter is considered as one of the best anti-aging and moisturizing agents for skin. Natural vitamins, antioxidants and fatty acids in shea butter make it amazingly nourishing and moisturizing. Can be used as a base in skin care products due to its anti-inflammatory and healing properties. Shea Butter is also used as an ingredient in soaps, shampoos, hair relaxers, lotions, & creams. Majestic Pure African Shea Butter is known for its skin healing properties; Vitamin F and vital ingredients help in maintaining skin-elasticity. It's also known for soothing a dry itchy scalp..